of colonials. The master hand of Portuguese that created the noble edifice of the church is not just important for its historic prodigy but its ancestral chronicles which was elevated by Pope Paul 4 during the inauguration which happened in around 1558 makes it divine and celestial. The church of Santa Cruz which is located within the narrative corners of Cochin is one of the eight churches in India but its perfect architecture and designs makes it pristine amongst all. To understand the reverie of the church traveler would require walking the days of 16th century when Portuguese were sole missionaries of Cochin. Although their arrival dates back the time of 15th century but it was during the call of 16th century they initiated with their project. 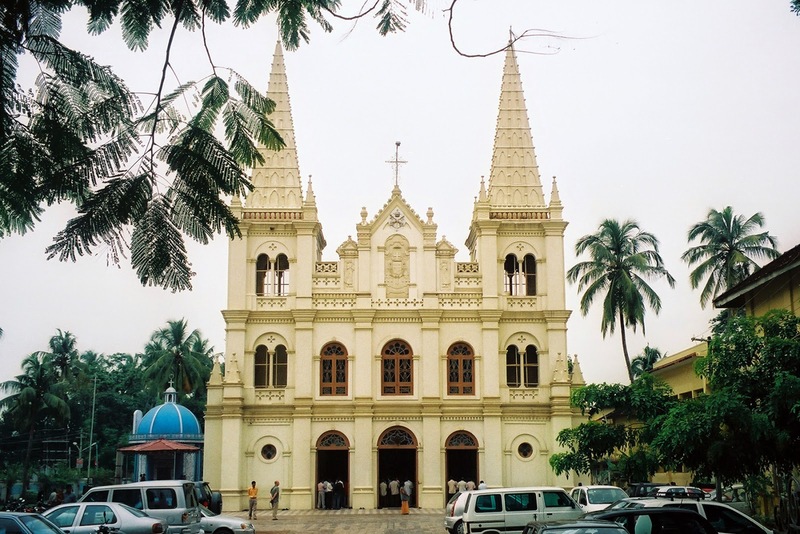 The construction work of the church started when Viceroy Dom Francisco de Almeida obtained permit from the imperial of the Cochin and laid the foundation stone during 1605 which was evidently noted for the feast day of the creation of the Holy Cross and according to its mythological importance the church was named as Santa Cruz. From the day of its creation till today the church has undergone series of renovation and when it comes to its status than the church was consecrated as basilica by Pope John Paul 2 during the time of 1984. The historical phase of the church can be classified into three sections the first phase was elaborately dominated by the Portuguese the second met the fate of destruction by Dutch although owing to its classic gothic architecture it escaped the brutal hand Dutch along with St. Francis but the divine faith of the church was crashed during the third phase when British plunged the walls until it was renovated by the Bishop D. João Gomes Ferreira during late 18th century. The architectural extravaganza reflects the gothic texture of Indo European style beside that podium and the wooden panels which were used in making the church still dramatize the beauty till perfection. While roaming around the Italian paintings that you will witness remarks the foundation day of the church and its majestic interior which is quiet spacious and worldly in nature speaks the wisdom of Portuguese. During the phase of destruction of the church the granite pillar was the only remains of it and owing to its historic importance and to recall the victory of their good fate over bad the pillar is kept within south eastern corner of the church. At present the church is amongst the eight basilicas around India and during 2004 the church completed its five centuries of existence which in turn makes it one of the oldest and historic churches that defines the accounts of Cochin. The gates of the church remains open throughout the week and it is only during the mass practice the visitors are not allowed rather than that traveler can walk here till 9 of morning till 5 of the evening to feel the cosmic radiance of the cathedral.